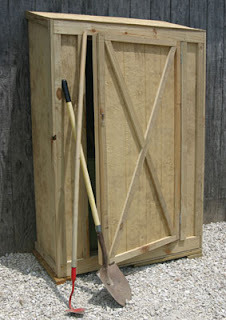 to Extreme How To, The Enthusiast’s Guide To Home Improvement, http://extremehowto.com/ for the plans to this super-simple garden shed measuring 3.75w x 1.75d. 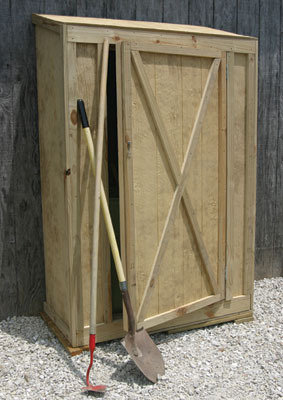 I would tuck this shed into a corner of the garden to keep all of my necessary tools handy. My only suggestion would be the addition of a back panel to make the unit free-standing. 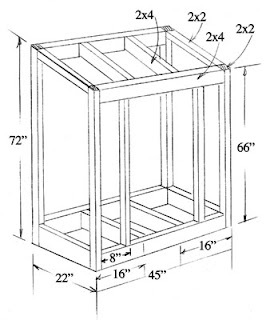 Due to the size and manner of construction, when building this shed with a back panel, it would need to be secured to the ground to prevent collapsing or falling over since it wouldn’t have the support of a structural wall (as shown).